Lladro have just added Puss in Boots to their Children's Tales Collection. Puss in Boots is the seventh figure in the collection and the figure includes rich colouring in bright blues and reds contrasting with golden details applied to the ornamentation on the cat's tunic. 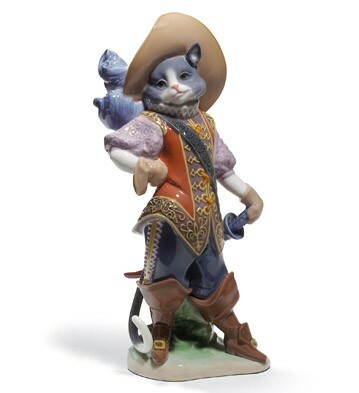 Puss in Boots is sculpted by Lladro sculptor Francisco Polope. "Master Cat; or, The Booted Cat" (early French: Le Maistre Chat, ou Le Chat Botté), commonly known as "Puss in Boots", is a French literary fairy tale about a cat who uses trickery and deceit to gain power, wealth, and the hand of a princess in marriage for his penniless and low-born master. The tale was written at the close of the seventeenth century by Charles Perrault (1628–1703), a retired civil servant and member of the Académie française. The tale appeared in a handwritten and illustrated manuscript two years before its 1697 publication by Barbin in a collection of eight fairy tales by Perrault called Histoires ou contes du temps passé. The book was an instant success and remains popular today.